If 2012 is The Year of the Rookie Quarterback in the NFL, then week 13 is the Week of the Rookie Quarterback. Robert Griffin III can’t fumble without scoring a touchdown. Literally. During his Monday Night Football debut, RGIII led the Washington Redskins to a comeback victory over their divisional rivals and the current Superbowl champions, the New York Giants. The Redskins sit one game behind the Giants in the ultra competitive NFC East. Griffin ran for 72 yards, which puts him at 714 for the season, breaking Cam Newton’s record for a rookie quarterback. And he did it with a “C” on his jersey. 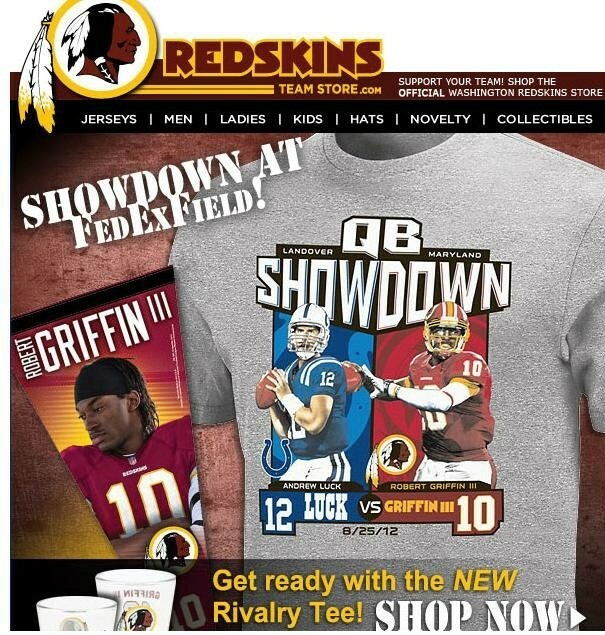 The Redskins voted RGIII in as captain of the offense following their bye week. In Manningesque style, Andrew Luck rallies the Indianapolis Colts to a fourth quarter comeback drive against the Detroit Lions and is racking up records faster than Peyton Manning is churning out pizzas. Luck is the first rookie quarterback (drafted number one overall) to win eight games, replacing Sam Bradford’s record of seven wins in 2010. Luck also owns the record for passing yards by a rookie quarterback in a game…and he still has four games to go for passing yards by a rookie for the season (watch out, Cam). Luck has the Colts firmly in place for an AFC wild card playoff spot. And Russell Wilson continues his campaign of shock and awe in Seattle, leading the Seahawks to a comeback win of their own. In overtime. At Soldier Field. Wilson launched a throwing and running attack on the Chicago Bears, which culminated in a 23-17 victory and their first road win of the season. The Seahawks, at 7-5, sit atop the stack for the NFC wild card draw. These aren’t rookies anymore, people. These aren’t kids. These are players. And they have become men right before our eyes. They are the future of their teams and the future of their sport. These are the players we will be talking about for a decade or more. They will lead, inspire, and leave their names on trophies, record books, and maybe some buildings along the way. This entry was posted in Colts, NFL, Redskins, Seahawks and tagged Andrew Luck, CCQB, RGIII, Russell Wilson. It was the longest five minutes in NFL history. The Monday night game between the Green Bay Packers and the Seattle Seahawks was over. The clock had run out. And we were waiting…to see who won. Rookie Quarterback Russell Wilson threw a Hail Mary with seconds left on the clock and both Seahawks Wide Receiver Golden Tate and Packers defender M.D. Jennings appeared to come down with the ball. One official ruled it a touchdown. The other, an interception. After reviewing the play, the replacement officials went with the touchdown. Touchdown it was. Only…it wasn’t. Upon further review, it looks like Tate not only didn’t have control of the ball, but may have taken both hands off of it at one point. It’s history now. The Green Bay Packers were victims of the worst call in NFL history and Seattle Seahawks Quarterback Russell Wilson became the first quarterback to ever throw a game winning interception. Twitter's never been this fun. I hope the real refs never come back. This is a blast. The players chimed in as well. 13th man beat us tonight. Yes, Lang will probably get fined for his tweet. But maybe the officials will pay it for him with the raises they are now sure to get. Golden Tate says he knows he had the ball. Packers Receiver Greg Jennings says he doesn’t think Tate’s claim would pass a lie detector test. Well, that would be one way around paying the refs. Hopefully it doesn’t come down to that. It is time to end the lockout with the NFL officials. For the record, I am not in favor of paying part time employees of the NFL a pension when pensions don’t exist for full time employees. Pensions don’t really exist at all in real life. Not anymore. But there is a compromise. And they need to find it. This entry was posted in NFL, Packers, Seahawks and tagged Golden Tate, M.D. Jennings, Monday Night Football, Russell Wilson. Ahhh…week three of the NFL preseason. When the starters actually play and our teams begin to look less like it’s the preseason and more like the regular season. For some teams, that was good news. For others…not so much. The New York Jets were featured on Sunday Night Football hosting the Carolina Panthers. Panthers Quarterback Cam Newton was in regular season form. He ran, he threw, he impressed. And his team went on to beat the Jets 17-12. No, the Jets don’t have a touchdown yet. That was four field goals for them. They have Mark Sanchez, they have Tim Tebow. Before the season started, we couldn’t stop talking about this duo and what they could do. And now that it’s started, we can’t stop talking about what they can’t do. There were visions of hope. After a thoroughly unsuccessful half by Sanchez (who was booed for letting the clock run down to end it), it was Tebow Time. Tebow did what Tebow does, which is run and throw to the other team. At one point, NBC Host Cris Collinsworth was dissecting the mechanics of his unconventional left-handed throw and Tebow broke out for a huge run and first down. The timing was nothing short of divine. This is what Tebow can do. A few plays later…perfectly thrown ball…to a Carolina Panther. This is also what Tebow can do. To be fair to Tebow, Fireman Ed was WIDE open there. Note to self: take Jets kicker in fantasy draft. Tebow was eventually booed as well. Yes, Jets fans booed both of their quarterbacks in one game and it’s only the preseason. Tough crowd. Michele Tafoya asked Sanchez about the Jets’ lack of a touchdown and he pointed out that there is still a fourth preseason game to be played. When pressed, he responded, “Looks like we’re saving all our touchdowns for the regular season.” When they count. Good plan. In the end, it was just another preseason game. Both quarterbacks highlighted their strengths. Luck threw a lot and ran a little, RGIII threw a little and ran a lot. Both had moments of brilliance. Both had rookie mistakes. The Redskins beat the Colts 30-17. The most impressive drives came from (wait for it)…Rex Grossman. Yes, Wrecks Grossman. The guy who has never really been able to establish himself as solid starting material (at least for long), was brilliant. Grossman finished 8 of 8 for 130 yards, 2 touchdowns and a perfect 158.3 quarterback rating. Don’t be surprised if he gets traded to the Jets! We said hello to: Russell Wilson as starting quarterback for the Seattle Seahawks, Peyton Manning’s first touchdowns (a pair) for the Denver Broncos, and Cornerback Vontae Davis as a Colt, traded to Indy by the Miami Dolphins. We said goodbye to: Terrell Owens as a Seattle Seahawk (and possibly as an NFL player), Pro Bowl Kicker Billy Cundiff as a Baltimore Raven (the team chose to move on with Rookie Justin Tucker), and many of the players who will be released by our teams as the rosters are reduced to 75 players. 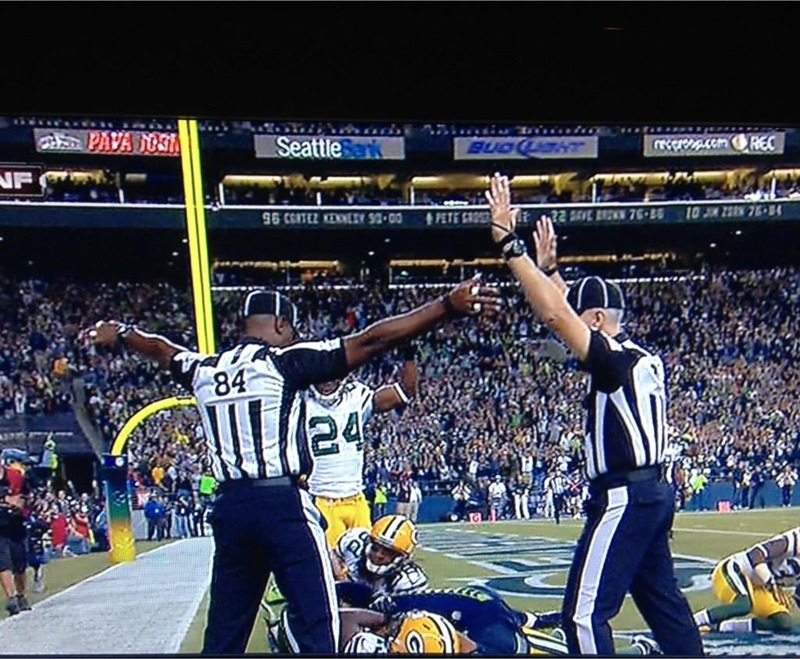 One thing we do hope is not for long…the replacement refs. There is confusion, discussion, and an on field meeting with practically every call. The games are being dragged out, and there have been mistakes. Plenty of them. But it is the preseason. And the games don’t count. Yet. The players, coaches, even the fans have been fairly patient thus far. That will end once those calls result in a “W” or an “L” in a team’s record. We need better than this for the regular season. And really, by the start of it. So, let’s hope week four of the preseason brings renewed talks between the NFL and the official officials. This entry was posted in Broncos, Colts, Dolphins, Jets, NFL, Panthers, Ravens, Redskins, Seahawks and tagged Andrew Luck, Billy Cundiff, Cam Newton, CCQB, Justin Tucker, Mark Sanchez, Peyton Manning, Rex Grossman, RGIII, Russell Wilson, Terrell Owens, Tim Tebow, Vontae Davis.